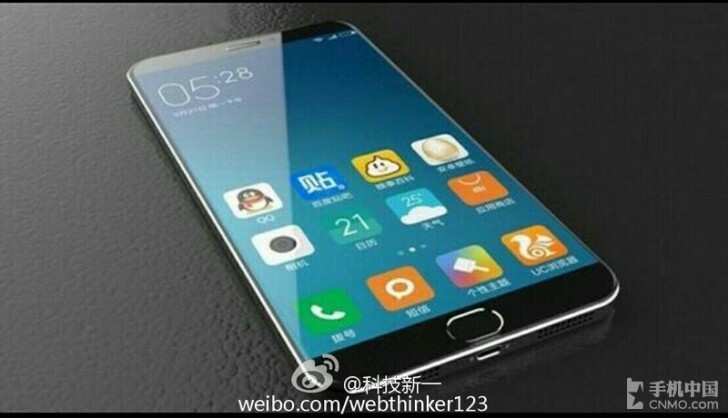 A couple of days ago we showed you a leaked image out of China which claimed to depict the upcoming Xiaomi Mi 5 in all its glory. And now we have yet another purported render of this smartphone. As you can see, this one's blurrier, and the device it shows is a little bit different than the one in the previous leak. If you look closely, the design of the Home button is a little rounder this time around, while the button itself occupies almost the entire height of the bottom bezel (which wasn't the case in the other leaked image). There are similarities too, for example when it comes to the almost non-existent side bezels. The new render also seems to confirm the use of so-called 2.5D glass on top of the display panel. What's iffy about this shot is that the Mi logo isn't visible in the top left of the phone, which is its normal placement. So hopefully you've taken what you've seen with a hefty dose of salt. The Mi 5 is supposed to arrive in early 2016 rocking Qualcomm's new Snapdragon 820 chipset, a fingerprint scanner integrated into that Home button, and other high-end specs to match these. Xiaomi CEO Lei Jun recently said the Mi 5 is "worth waiting for".